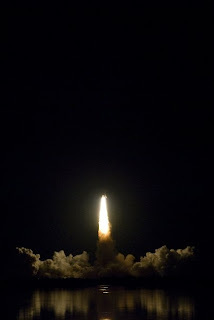 This past Wednesday, July 15 Space Shuttle Endeavor was launched on its way to the International Space Station. 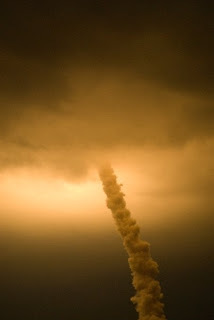 While I was not fortunate enough to be at the launch, I WAS fortunate enough to attend a launch last year; specifically STS-123 on March 11, 2008. 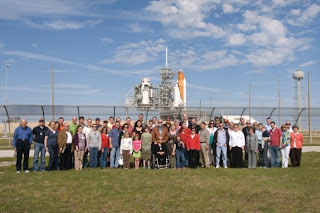 It just so happens that Endeavor was used for STS-123 as well as the mission currently being flown STS-127. So, for today’s Friday Top 5 I thought it would be fun to reminisce on such an awesome experience! 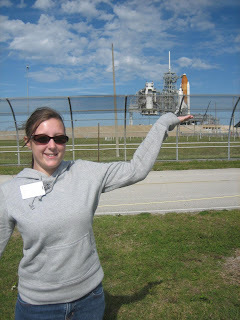 The VAB is, how can I put this?...HUGE! By volume it is the world’s 4th largest building and the largest one-story building in the world! Just for comparisons, each of the stars on the American flag painted on the building is 6 feet across, the blue field is the size of a regulation basketball court, and the stripes are as wide as a standard road lane!!!! The VAB also boasts the largest doors in the world…a record 465 feet tall which take 45 minutes to completely open or close! 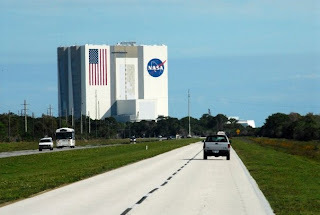 Since we were touring the Kennedy Space Center (KSC) on launch day they didn’t let us get out much, but here is a picture as we drove towards the VAB on our way to the launch pad! As its name implies, the Space Station Processing Facility (SSPF) is where payloads are readied (or, “processed”!) 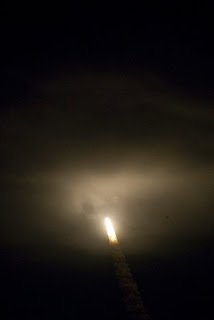 for launch to the International Space Station. 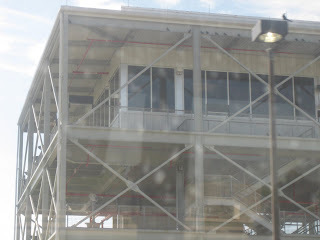 The first area of the facility had life-size mock-ups of various modules which you can walk through! The second area was a viewing window into the large white room type area that actually housed the hardware, modules and integration equipment for the International Space Station! 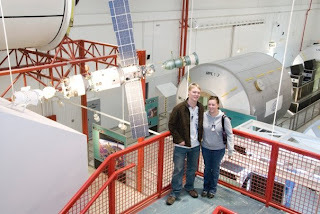 Here is a picture of Chris and I in the SSPF! I had a good time reading all the labels in Russian and telling Chris what modules they were before he looked them up on the diagram! Go Russian! 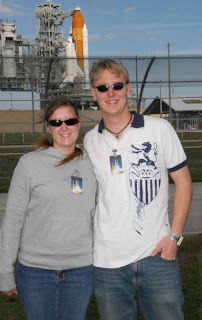 Number 3: The Marshall Space Flight Center Astronaut/STS-123 Party! 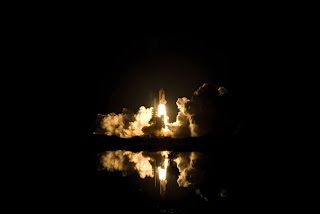 Number 2: The Launch Pad on LAUNCH DAY!!!!!! At the risk of sounding like a loser…or maybe just a huge nerd…the moment we stepped off the bus at this location I had tears in my eyes. 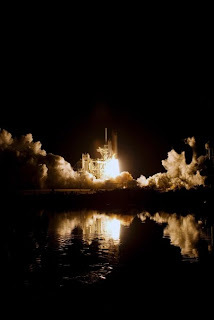 I had watched so many launches on my little NASA TV internet site and read so many books about space and the space shuttle and have worked so hard to maybe one day be an astronaut…it was just absolutely overwhelming. After gaining my composure, we took some more pictures! Ok. 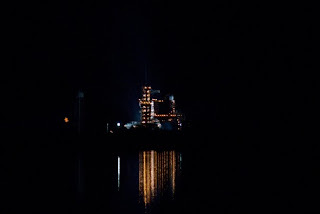 So now that Chris was completely spaced-out after touring all day and then going to the visitor center and then driving around KSC…it was finally time for the 2:38am launch! 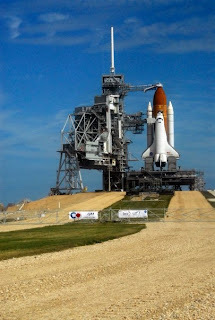 Honestly, I had no idea what to think about…this was the only thing going through my mind… “HOLY CRAP I’m going to see the Space Shuttle Launch!!!!!!!!!!!!!!!!!!!!!!!!!!!!!!!!!!!!!!!!!!!!!!!! !” And literally the voice inside my head used that many exclamation points! When we got to the viewing area (which is the closest outside viewing area, where the extended families of the astronauts are, hey, maybe some of you will be there someday!) 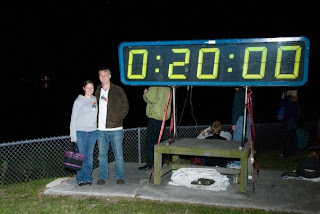 we took a picture by the countdown clock…holding at T-20 minutes. 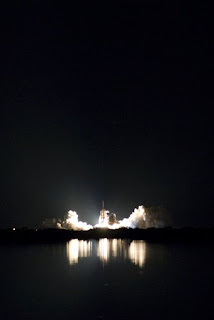 Here’s to another successful mission on STS-127 Endeavor! God Speed! wow... I really enjoyed this one ape...This was a great experience. (Thank you Mr. King) There was alot of emotion involved, even for those of us who haven't read leagues of books about space. Couple of things I would like to point out. April talks about this being the closest outside facility, Banana Creek (where we were) is about three miles from the pad. I know three miles sounds like a lot... but when you think that only one MILE away from the shuttle at lift off, the pressure is so intense that it will actually cause your heart to stop (resulting in your death), three miles is a perfectly close enough for any sane veiwer. >Sound, I have had several friends ask me, "So was it loud?" well...no. Don't get me wrong, it was loud... the thing I will never forget though, is the amount of pressure. 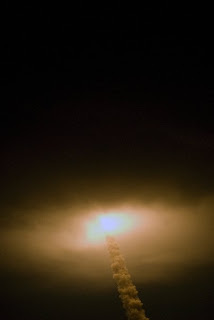 The area got kinda packed around t-0 so, I was standing behind April, maybe 6-8 inches apart and the vibration was so intense that we were bumping into each other. It was so intense that the fish in the creek between us and the shuttle actually jump out of the water, spooked by the sudden spike. 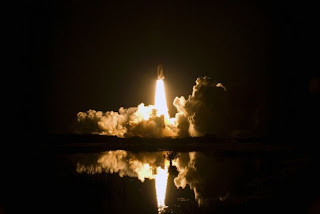 If you watch the youtube video you can acutally see the fish jump (youtube: Banana Creek: STS-123). 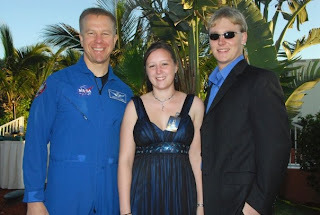 Lastly, I am an aerospace engineer (in training) who happens to like Sharks and some fish, not a marine biologist.